Schatz's victory, his sixth of the season, gives the Outlaw drivers the upper hand as the annual feud over sprint car supremacy has officially kicked-off. "We want to win everywhere we go, but man when you come to Pennsylvania the fans here are feisty and you hear a lot of swear words directed to you - that's what this is about," Schatz said. "This is a free country and I am glad there are people who can voice their opinion that they hate you or love you. "It makes such a great comradery and it lifts up the competition level of the PA Posse racing on a weekly level and the World of Outlaws' racing. That's what this is about, to keep pushing each other to get better, and that's what makes our sport what it is and makes it as dynamic as it is." The Posse members did not make it easy on the Outlaw driver as they fiercely fought all night to protect their home turf from the invaders, eventually placing two drivers on the podium, Danny Dietrich and Brent Marks. "We just go to every race and try to win like a normal Friday or Saturday night," Dietrich, a Gettysburg, Pa. -native said. "The biggest prize right now is Knoxville Speedway is offering some beer for the first Posse driver to win an Outlaw show. "All jokes aside though, we want to get a win against these guys - it would mean a lot." "The rivalry between us means a lot because they're the best in the business and you have to race so much more aggressively against these guys because that's how they race, and it is really tough. Its respect on both sides, we race them hard and they race us hard back. It's cool, the fans are really into it and it's a cool atmosphere to be a part of and that's what makes racing in Pennsylvania so much fun when the Outlaws come into town." When the night started, the fight for quick-time was a one sided affair, as the Posse members swept both flights of qualifying with Danny Dietrich fastest in the first and Lucas Wolfe fastest in the second. However, as the night progressed, the Outlaw drivers continued to encroach on the Posse dominance at the top of the charts, as the two split the four heat races with each winning two. After showing they could challenge the Posse in the speed department, the Outlaws were aided by a little luck as the dash invert draw placed Schatz, in the Bad Boy/Chevy Performance No. 15, on the pole for the six-lap race, while sliding Dietrich, in the Sandoe's Fruit Market/Hickory Run Orchards No. 48, to the fourth position. Dietrich rallied in the dash to finish second, but he could not catch Schatz, who dominated the race and landed on the pole-position for the 35-lap feature race. Once the green flag dropped in the feature, Schatz managed to escape from Dietrich and Joey Saldana who started third. Saldana slipped back in the opening laps as a hard-charging Marks, in the M&M Painting and Construction/Weaver's Body Shop No. 19M, made his way to the front of the field from his sixth starting position. The feature ran caution free for all 35 laps, but Dietrich and Marks did not need the yellow flag to reel in the leader. In the closing stages of the race, both Posse members had managed to close to Schatz's back bumper for the lead as they fought through heavy lapped traffic. 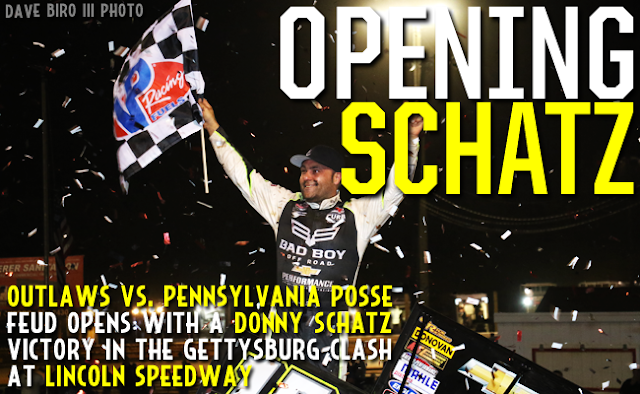 The race came down to the final lap, as second-place Dietrich pulled to the inside of Schatz exiting turn four but came up just short of muscling around the leader, as Schatz was able to hold on and claim the opening round of the Outlaws vs. Pennsylvania Posse rivalry at Lincoln Speedway. "It's great to win here at Lincoln, especially after never winning here before," Schatz said. "Everybody was pretty equal and you can see that because not too many cars got lapped during the race and that's just the nature of the beast. That front-row starting spot was key, as it has been at a lot of races this year, and I am glad I could capitalize on it. "The expectation is you want to win every night, and it's not going to happen. We haven't been that bad but for the standards this team has put forth the last several years, it kind of seems that way. We have tried several things, and I guess to be in the situation we are in right now where we can try these new things and make ourselves better, that's going to pay off for us at the end of the year." Dietrich, who won beat the Outlaws on a Summer Nationals night at Williams Grove Speedway in 2015, came up just short of winning the race he dominated in 2012 and 2013. "This was a good run for the team," Dietrich said. "To be able to run second out of 38 or 39 cars it's definitely a good feeling. We're satisfied with our finish tonight, just too bad it couldn't be one position better. "Donny [Schatz] is a heck of a racer, catching him and passing him was going to be a whole other problem. He was in the preferred on the start so that made things a little tougher, but congrats to him and we're going to move on to The Grove tomorrow." Marks podium finish gives the Posse drivers two of the three top spots, and three of the top-five finishing positions. "We had a pretty good run tonight," Marks said. "We haven't been too good here the past couple of years, so to run like we did here was pretty good for us. "I got to second there, got past Danny [Dietrich] in turn three, and I thought he was going to slide me back, so I drove it in too hard and just got over the ledge a little bit and he got back by me. I felt like I blew the race there because I felt like we had a good enough car that if we got some laps we could run down Donny. Don't know if I could have done anything - maybe shown him my nose and put some pressure on him, but never got the opportunity. Other than that, I felt like we had a good run against the Outlaws and I can't complain." The World of Outlaws Craftsman® Sprint Car Series continue their swing through the Keystone State as the series heads to Mechanicsburg for a double-header weekend at Williams Grove Speedway on Friday, May 20 and Saturday May 21. For more race information and ticket purchasing options, visit: www.WoOSprint.com/Williams-Grove. RACE NOTES: Donny Schatz becomes just the second Outlaw driver to win at Lincoln Speedway since 1997...Logan Schuchart captured his second top-five of the season...Joey Saldana picked up his 10th heat win this year, just one behind Brad Sweet's series-leading 11. CONTINGENCY WINNERS - MSD Ignitions ($25 cash): Shane Stewart; MSD Ignitions ($50 cash): Donny Schatz; Penske Shocks ($50 cash): Brent Marks; JE Pistons ($50 cash): Logan Schuchart; VP Racing Fuels ($50 cash): Dustin Hogue; Edelbrock ($50 cash): Jason Johnson; Comp Cams ($50 cash): Daryn Pittman; Morton Buildings ($50 cash): Joey Saldana; Cometic Gasket ($50 cash): David Gravel; Super Flow ($50 cash): Greg Wilson; Craftsman/Sears ($100 cash): Danny Dietrich; KSE Racing Products ($100 product certificate): Dustin Hogue; Comp Cams ($50 product certificate): Donny Schatz; JE Pistons (Set of Rings): Greg Wilson; JE Pistons (Set of Rings): Jason Sides. SEASON WINNERS: ); Donny Schatz - 6 (Volusia Speedway Park on Feb. 14, The Dirt Track at Las Vegas on March 4, Stockton Dirt Track on March 18, Stockton Dirt Track on March 19, Silver Dollar Speedway on April 2, Lincoln Speedway on May 19); Brad Sweet - 6 (Volusia Speedway Park on Feb. 13, Volusia Speedway Park on Feb. 14, Cotton Bowl Speedway on Feb. 26, Ocean Speedway on April 1, Bakersfield Speedway on April 15, Plymouth Speedway on May 13); Daryn Pittman - 3 (Royal Purple Raceway on Feb. 27, Perris Auto Speedway on April 16, USA Raceway on April 18); David Gravel - 2 (Thunderbowl Raceway on March 12, Tri-State Speedway on May 14); Joey Saldana - 2 (The Dirt Track at Las Vegas on March 3, Devil's Bowl Speedway on April 22); Shane Stewart - 2 (Arizona Speedway on March 6, Devil's Bowl Speedway on April 23); Jason Johnson - 1 (Placerville Speedway on March 24); Jason Sides - 1 (I-30 Speedway on April 26). World of Outlaws Craftsman® Sprint Car Series Statistical Report; Lincoln Speedway; Abbottstown, Pa.; May 19, 2016. Last Chance Showdown - (12 Laps - Top 4 finishers transfer to the A-feature) - 1. 51-Freddie Rahmer  [-]; 2. 51S-Stevie Smith  [-]; 3. 59-Jim Siegel  [-]; 4. 16-Gerard McIntyre  [-]; 5. 55K-Robbie Kendall  [$300]; 6. 12-Mike Bittinger  [$250]; 7. 21-Brian Montieth  [$225]; 8. 13X-Tim Shaffer  [$200]; 9. 1-Sammy Swindell  [$200]; 10. 2W-Glenndon Forsythe  [$200]; 11. 1A-Jacob Allen  [$200]; 12. 15A-Adam Wilt  [$200].